Arrival Lodge is a modern well furnished, clean, safe and affordable budget hostel with individual bedrooms and Dormitories, perfect for individuals, couples, backpackers and small groups visiting the centre of the Gold Coast on a budget. We are located in the heart of the Gold Coast CBD close to Surfers Paradise and walking distance to beaches, colleges and English language schools, not to mention the fantastic shopping and world class restaurants. 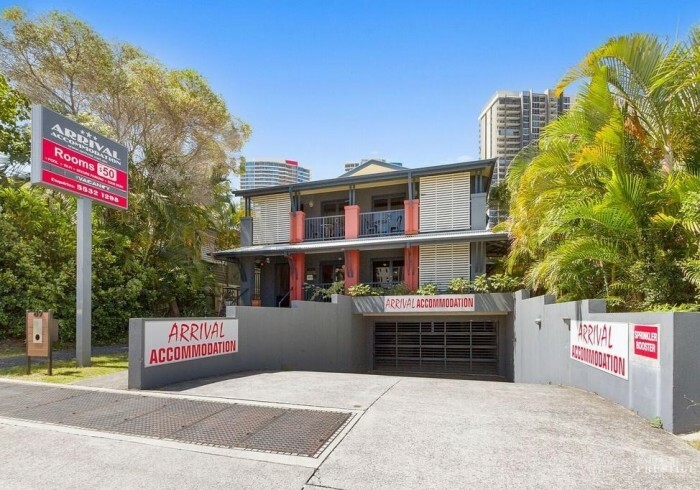 The Light Rail Station (tram) is only 50m away, 10 mins (4 stops) away from Surfers Paradise and connects you to everything you will need. We are close to the Australia Fair Shopping Centre, the Broadbeach Parklands & China Town. Situated on the famous Gold Coast, we offer a very friendly home away from home experience. There you will find clean, modern, safe and friendly accommodation. We are closely situated to all your needs and offer single, double, triple & family room type accommodation as well as onsite secure parking. There is a large fully equipped kitchen & Dining Room, lounge with large TV and complimentary tea & coffee, laundry, tour desk, free Wifi, beautiful outdoor swimming pool, full disable access and friendly staff always ready to help you. There are shared bathrooms on every level, sunbeds surround the in-ground swimming pool and our professional on-site management team ensure all your needs are met. ALL ROOMS REQUIRE A $50.00 KEY DEPOSIT, REFUNDED UPON RETURNING THE KEY. Cancellation Rule and Fees: If cancelled up to 30 days before arrival, 100 percent of the total amount will be forfeited.